Join a community that believes in academic excellence through a curriculum that is relevant to the real world. UNO appreciates that learning is a lifelong process and not every route to college is traditional. We offer several options and an education that will serve you for a lifetime. You are currently enrolled or you've completed high school and have never enrolled at or attended another college or university after high school. You've earned college credit after high school and wish to attend UNO. You currently attend another University of Nebraska campus and plan to enroll at UNO for a term. You currently study or plan to study in the United States on a visa. You're a high school graduate, college student, or graduate interested in taking classes but not in a degree program. 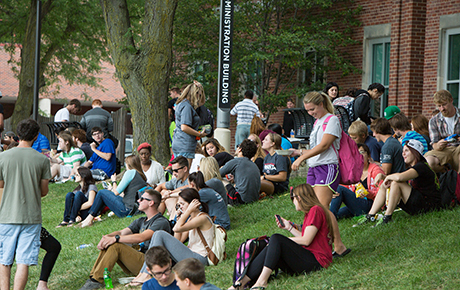 You're a former UNO student or Alumni who is interested in pursuing an undergraduate degree. You're in the military or a veteran interested in a degree or non-degree coursework. You're over age 21 and interested in a degree or non-degree coursework. The University of Nebraska Omaha (UNO) is committed to assisting all members of the university community in providing for their own safety and security. The annual campus security and fire safety report is available on the university website.